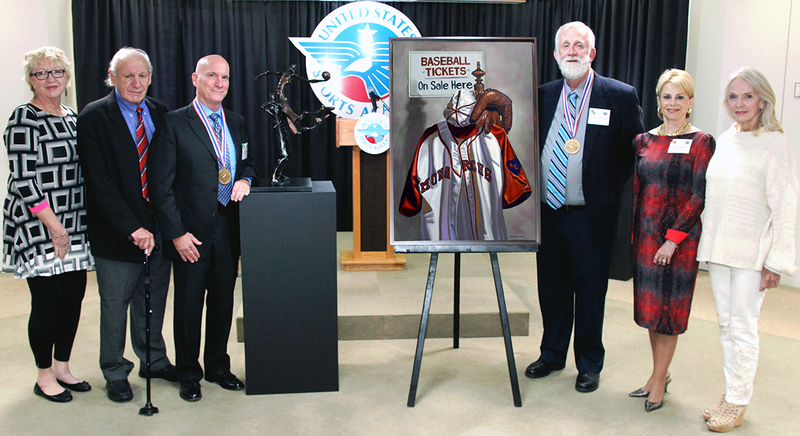 Acclaimed sculptor Richard Watkins, standing next to sculpture, and award-winning painter William M. Williams, standing next to painting, were presented the United States Sports Academy’s 2017 Sport Artist of the Year, Sculptor, and 2017 Sport Artist of the Year, Painter, awards at the Academy’s 33rd Annual Awards of Sport program. From left are Academy Art Committee Chairperson Nancy Raia, Academy Founding President and Art Committee member Dr. Thomas P. Rosandich, Watkins, Williams, Trustee and Art Committee Member Emerita Susan McCollough, and Art Committee member Kay Daughdrill. DAPHNE, Ala. – Acclaimed sculptor Richard Watkins and nationally known painter William M. Williams were awarded the United States Sports Academy’s 2017 Sport Artists of the Year awards at the Academy’s recent 33rd Annual Awards of Sport program. A highlight of the event on the Academy’s Daphne campus was the unveiling and donation to the American Sport Art Museum & Archives (ASAMA) permanent art collection works by Watkins and Williams. Watkins’ basketball piece “Slam Dunk” and Williams’ piece “Satchel’s Monarchs,” which honors the legacy of baseball legend Satchel Paige, are now on permanent display at ASAMA. In addition to the permanent pieces, a show featuring works from both artists is now on display at ASAMA in the Dr. Thomas P. Rosandich Gallery. Watkins was presented his award by Academy Trustee Jack Scharr. Williams received his award from Trustee and Art Committee Member Emerita Susan McCollough. Watkins’ work is known for capturing the energy, dynamics and balance of amazing athletes at that single moment of intense action: the slam dunk, the long pass into the end zone, the double play. He exaggerates the physical proportions to an extreme, giving them incredible action and an engaging quality. Watkins grew up in West Virginia, where he enjoyed drawing and sculpting with whatever materials he could find. After college, Watkins worked in several design studios in Cincinnati before making his way into the toy design business. After 25 years designing toys, Watkins began to turn his old sketches and models into larger, more finished pieces of art. “I love sculpture and I love sports. My work is an attempt to mix the two,” Watkins said. “Once I retired I began to look through all those old sketches and models and tried to turn them into larger, more finished pieces. “I know they don’t look realistic, but I’m not going for realistic,” Watkins said. “I’m trying to capture the dynamics and balance of these amazing athletes. An award-winning artist, some of his most recent accolades include being named Best in Class at the 2017 Chastain Park Arts Festival in Atlanta. 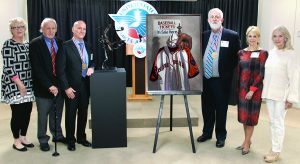 He also earned first place honors at the 2017 Metro Montage XVII at the Marietta/Cobb Museum of Art in Marietta, Ga.
Williams’ paintings are the permanent collections of the National Baseball Hall of Fame, the College Football Hall of Fame, the Commissioner of the National Basketball Association, the New York Yankees, the U.S. Military Academy at West Point, the U.S. Naval Academy and the Butler Institute of American Art. He has won numerous awards, including the Lake Orion Art Center Award, Best of Show in the Art of Golf Festival in Pinehurst, N.C., and Best of Show at an Ohio statewide art competition.